A down market has proved no match for a niche Washington state precaster with an eye for automation and product that can ship to contractors and developers across the country. Surely one of the few producers in any concrete market segment reporting measurable year-over-year sales gains in 2010, Diamond Concrete Products has staked its claim in stock and custom stair treads or risers. Philip Burman, a South Africa native who acquired the company in 2007, recently relocated from a cramped Smokey Point, Wash., shop to an 11,500-sq.-ft. plant in nearby Arlington. The move brought build out of an automated form, stripping, and product handling system that has netted jaw-dropping results. We have doubled our production area, but increased output 500 to 600 percent, says Burman, a one-time farmer who had dabbled in concrete. Pouring a step used to take 90 seconds; now it's done in 18 to 25 seconds. A shift in the old plant would typically see 110 pieces finished, he adds. Now, we can turn 300 to 600 in the same period. Diamond Concrete casts 32-in. to 8-ft.-wide units in such shapes as cantilever, open or closed riser (7 in. ), half-riser (4 in. ), Drop-in-Place, and spiral. The company offers standard or custom finishes, including polished concrete, terrazzo, glow-in-the-dark, and exposed aggregate, suited for a wide range of commercial and residential applications. In conjunction with area steel fabricators, Diamond Concrete has developed a proprietary precast insert as an alternative to cast-in-place concrete for multi-level stair towers. The Drop-in-Place treads reduce a general contractor's costs and downtime for all trades during stair pours, while eliminating post-pouring cleanup and paint touch-up. They can be installed by a two-man crew at a rate of 30 pieces/hour, and are service-ready within three hours of placement. The Drop-in treads have been approved by U.S. Army Corps of Engineers, following multiple installations at Joint Base Lewis-McChord, Ft. Lewis, Wash. Other recent projects have included the SeaTac International Airport light rail station and a new Amazon.com corporate center, both in Seattle. 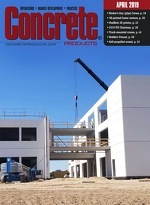 Diamond Concrete has filled capacity gained from the plant relocation and automated production line through repeat business and Google advertising, shipping risers and treads from the Pacific Northwest to as far as North Carolina. The company has distributors in Ohio, Pennsylvania and Nevada, and is seeking national presence through preferred vendors, including lumberyards and contractor supply stores. A unique form and product conveyor, coupled with light-duty (< 1,000 lb.) overhead handling equipment and Grout Hog mix bucket, has allowed Diamond Concrete to eliminate the use of forklifts in the casting area. That has resulted in a three-digit productivity gain, as the number of molds that can be placed on the plant floor for curing has increased from 140 to 320. At the heart of production is an Atlas Robotic Conveyor System, a high-tonnage device that curtails fork lift traffic and increases plant floor space. The system is the product of nearly three years of testing and engineering Philip Burman underwrote with Atlas Industrial Equipment LLC, Bellingham, Wash., founded by Thom Prichard, former Diamond Concrete proprietor, and Fred Opp, mechanical engineer. When powered, the Atlas Conveyor has a robotic plate roaming twin 4-in. structural channel rails from one end to another, shuttling pallets bearing forms or cured product. Fed power and compressed air through a link-style umbilical, the robot senses a pallet placed above, then effects 1,000-lb. lifting force to place it at the opposite end of the rail. It continues until the rail is full, unloading in a similar sequence. At Diamond Concrete, the Atlas Conveyor works in tandem with an overhead conveyance system for the tread or riser molds. The line is set up to clean, dry and oil the molds, prior to threading of treads. The overhead equipment and mold conveyor combine for nearly hands-free casting. Arlington plant ramp up continues this year with the installation of a BFK M6 reclaimer, affording aggregate and water recycling while contributing to compliance measures Diamond Concrete undertakes in a state notorious for process water management regulations.